Because casement windows are hinged on their sides, they can swing open entirely, allowing the fresh breeze to enter the house and with just a simple turn of a h and crank, you can easily close the window and seal your home when the weather gets tough. This makes it easier for homeowners to control the air penetrating their homes. Because casement windows are easily sealed tight, they help prevent air entry and leakage, locking in the comfortable temperature inside your home during summers or winters. This can save you valuable dollars yearly on energy costs. Muntins are the strips of wood or metal that separate and hold the panes of glass in a window. These sash bars obstruct your view of your home’s surroundings. Casement windows, on the other h and, feature no muntins so they have a larger glass surface area for a brighter home and a better view of the great outdoors. 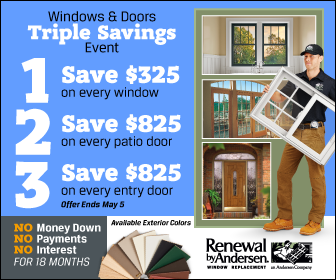 If you are interested in casement windows, trust only the best: Renewal by Andersen® of St. Louis. We offer high-quality casement windows made with our revolutionary material Fibrex®. This material was formulated not to warp, chip, fade, or corrode so you can trust that your replacement windows will last a long time, and will definitely bring the these benefits to your home. Just give us a call for a free estimate for windows installation in St. Charles MO and the surrounding areas, including Florissant, O’Fallon, and Chesterfield.